We began the new year by beginning two new construction homes. The first is the tiny house for Samuel. Last week our friends from Sovereign Grace Church – Chippewa Falls Wisconsin set the concrete blocks. 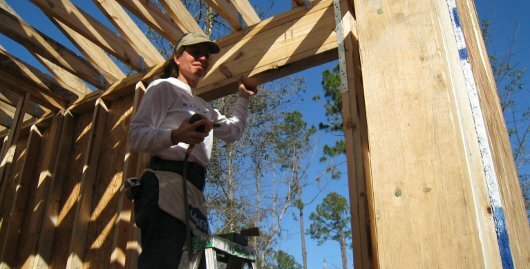 This week folks from ARBCA churches framed the house. For the second house, as the new year rolled in a group of BGM (Baptist Collegiate Ministries) students from Georgia cleared the property. Last week the Wisconsin team strung out the lines and set placements for the pilings. 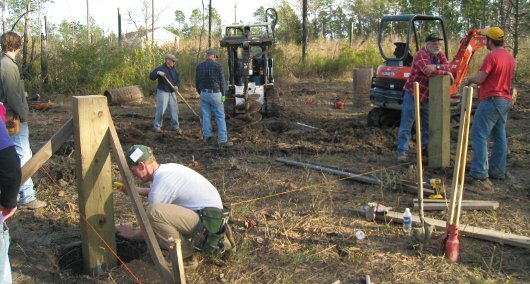 This week the ARBCA crew drilled the holes, set the pilings, and poured the concrete. Lord willing, next week folks from Oak Grove KY will frame the house and keep things moving forward. All the other projects have seen progress also.. With about 150 or so volunteers here this week we have been working on about 25 houses and ongoing projects to the glory of God. I am excited about what God has in store for the work this coming year. Continue to keep us in prayer and consider making a mission trip to Lakeshore to be a part of what God is doing for the spread of his fame.